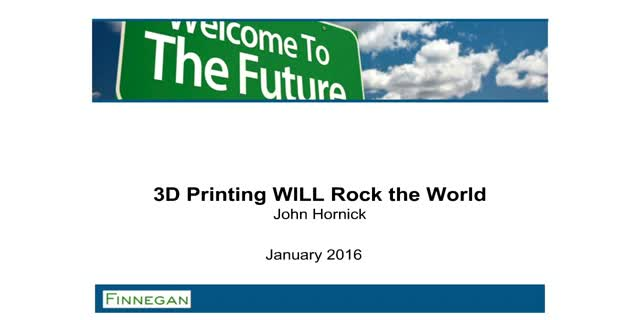 IP lawyer and 3D printing expert John Hornick’s new book 3D Printing Will Rock the World does an excellent job of describing exactly how 3D printing will rock the world from a technological, economic, and, even, social standpoint. And, by the end of his book, readers may very well be convinced that, because of this technology, the world will be so thoroughly rocked that it will become unrecognizable. CELLINK is the final puzzle piece in the 3D Bioprinting industry we all have been waiting for. CELLINK is a bioink that can universally be used on a wide range of 3D Bioprinters. CELLINK can also be used independently of any printing device, in case you want to perform simpler experiments of 3D cell culturing. The unique biocompatibility and printability of our bioink offers outstanding results that will take your research to the next level! Our laboratory engineers microenvironments to control the fate of cells being used in tissue repair, with the main application being cartilage lesions and microcracks. The approaches include the development of patterned, functionalized hydrogels, mediation of cell-cell and cell-tissue adhesion through nano-coatings and surface treatment, control of inflammation and oxygen tension pathways, and release of cytoskeletal- and Rho GTPase-modifying small molecules to achieve stable phenotypes. Using additive manufacturing (bioprinting), it is possible to combine these tools to generate spatially complex tissues containing multiple cell types and materials. Our goal is the translation of these technologies to the clinics to improve the outcome of current cell-based therapies. Jean-Manuel brings more than 20 years of experience in scientific research and medical technology innovation to his work on the Vizua team. While earning his masters degree in neuroscience at Drexel Medical School in Philadelphia, he directed research projects on 3D-reconstruction of neuronal networks and regenerative quantification. Dr. Baena a bioprinting and orthopedic industry professional. He is founder and CEO of BRECA Health Care and REGEMAT 3D. His work includes professional biomedical engineering and biomechanics, 3D bioprinting, medical devices development, CAD, CFD, FE, creating mathematical models to simulate complex environments and make decisions - Using technology to improve people´s quality of life. Dr. Shanjani has extensive research experience in system design and development, modeling, testing and utilizing 3D-printing and bioprinting technologies, hardware and software for biomedical, tissue engineering and regenerative medicine applications. He will speak about how 3D printing can be applied to regenerative orthopedics. The Ourobotics Revolution 3D Bioprinter, is a relatively low-cost machine that can print with 10 materials in the same bioprinted structure (with the potential to add even more). It also includes a heated enclosure and an upgradable and expandable design. Because of its modularity, current applications include everything from human tissue engineering, to pharmaceuticals, food, synthetic biology, electronics, batteries and even textiles. Plastic surgeon Carrie Stern is the creator of MirrorMe3D, a company which offers 3D printed models to reveal the outcome of breast surgery, or other transformative surgery. By displaying past surgical results in 3D form, patients can gain new insight into the effects of aesthetic surgery. Dr. Ciprian N. Ionita of the University of Buffalo and his research team are printing detailed models of patient brain vasculature. These are being used for simulating strokes, for complex AVM (arteriovenous malformation) surgical preparation, and other applications. Richard Izzo, Graduate Student of Biomedical Engineering at University of Buffalo. 3d Printing has not only provided the technology to make more efficient prosthetics for arm and Leg amputations, but that has brought the prices of these prosthetics down tremendously and made this valuable products much, much more affordable for patients. Dr. Laan creates 3D models of a patient’s brain tumor in order to improve patient communication and understanding of their condition or upcoming surgery. Dr. Silva is coordinator for the three dimensional division of CTI Renato Archer, Brazil and the home of another GNU based open source tool, InVesalius, specifically made to ease surgeons and medical professionals into using 3D analysis and exporting 3D models for printing in an intuitive user environment that is as easy as 123. Dr. Roger Smith, CTO of the Florida Hospital Nicholson Center in Celebration, Florida, speaks about the future of medical robotics.